Fugly Horse of the Day: Excuses, excuses or "Why would you even admit that on the web?" Excuses, excuses or "Why would you even admit that on the web?" Advertising a horse should be like going to a job interview. You want to arrive on time, neatly dressed, with several immaculate copies of your resume, some knowledge about the company, and some mental organization about how you are going to answer the typical questions. The last thing you want to do is run in there with a run in your nylons, 10 minutes late, with a coffee stain on your resume and no clue what you're doing. That wouldn't be the way to sell yourself, and this ad is not the way to sell a horse. "Gorgeous reg. 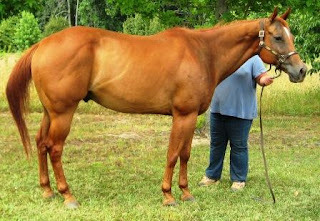 QH gelding. Successfully shown in pleasure classes and trail ridden. Has been owned by a friend of mine for several years. The folks that were showing him have a new show horse they are spending all their time with. He is n/h but has no history of any problems. Our vet, Dr. Harvey, felt comfortable with the fact that if he hasn't had any problems at 12 yrs old then he most likely would not develop any at this point. Big stout legs, chest, and rump!" FHOTD in: My guess is Dr. Harvey would have kittens, big furry ones, if he knew they were saying he was pretty much promising a HYPP positive horse wouldn't have an attack. Any vet should know that predicting the likelihood of a HYPP attack is about as reliable as predicting where the roulette wheel will stop. We have plenty of reports of horses having their first significant/noticeable attack in their teens, sometimes with serious consequences to the horse or the rider if he is being ridden at the time. "This gelding had been without water for at least 1 day when we took these photos due to the caretaker of my out of state horses being suddenly hospitalized. He appeared a little dehydrated but went right to drinking plenty of water and eating." You did NOT actually admit that on the web. *sigh* Why not just change your name to Careless Acres Sport Horses? While pretty much everybody in the horse biz has experienced either a farm sitter gone lazy/stupid/drunk or an emergency like this, most of us managed to find out and fix the problem before a day or more had passed where the horses got no care at all. Second, we did not run right out and post the near-disaster on the web for all to see. When you screw up at work, do you run to the web to tell everybody how you f'ed up? Of course not. But not these folks - they not only have to tell everybody in the world, but they have to immediately take pictures of the drawn-up, dehydrated horse and use THOSE for advertising! Heaven forbid you WAIT a few days til he's looking better. Not that this poor guy is ever going to look good. 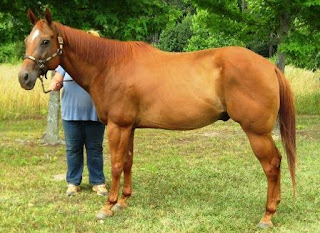 He is, conformationally, the reason people tell me halter bred horses/Impressive breds don't ride. They really don't all look like this calf-kneed, camped out, put-together-out-of-spare-parts train wreck. I know I sound like a broken record, but web sites and other forms of advertising are marketing materials. The goal is to make your sale horses/stallion at stud/show horses look good. If you have to make excuses for a picture, that's probably a sign you should just go back and try again. It's not like you're all wasting expensive film here. Everybody's got a digital camera these days - take 50 or 100 pics if that's what it takes to get it right. Don't take pics of a horse when he's injured or "had a hard winter' or "still gaining weight" (unless he's a rescue and you're showing progress) or unfit and hay-bellied or dehydrated or whatever. Wait until you can display your horse at his best. Do you want him to get "hired" as someone else's horse, or not? And I'm not even gonna go into marketing a N/H as safe for kids and having a FIVE YEAR OLD ride him in the videos. Again, that's the kind of thing where, if something bad happens, it won't be an "accident." It will be a reasonably likely outcome of something you knew, or should have known, was a really bad idea.